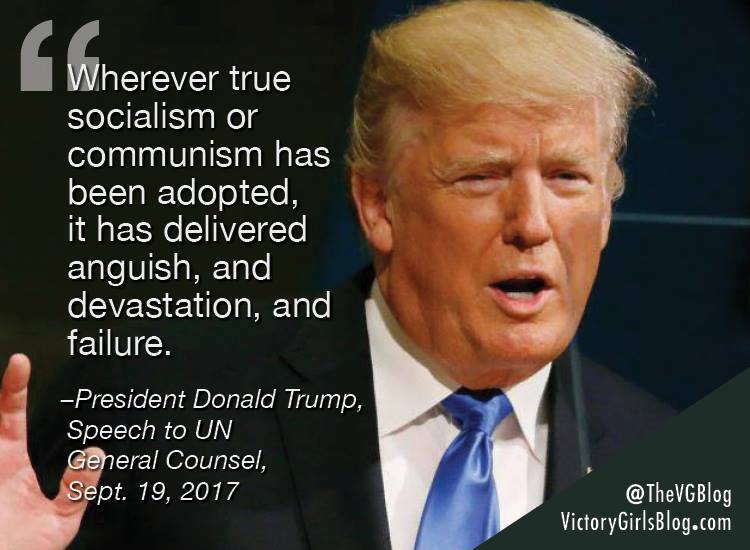 According to this report, socialist-communism is the failed political ideology that between the years 1917-2017 killed 100 million people—whose power behind was able to be wielded by socialist leaders who are able to divide their nation’s citizens apart from each other (Identity Politics) while controlling every word their citizens say (Political Correctness)—and whose historical main enemies are religious institutions these socialists have led an all-out battle to destroy throughout the West. As Soviet-Russian socialist leaders quickly learned, though, this report continues, the wholesale destruction of religious institutions could never be accomplished without giving people another existential (concerned with existence) reason for functioning in a society—and whose answer for saw these socialist leaders keeping their peoples in continuous fear of the West. 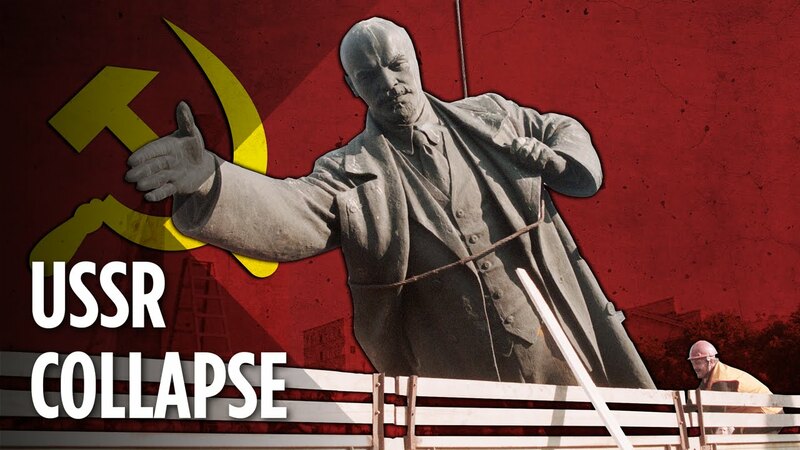 Likewise in the West, this report details, its socialist leaders used unremitting fear of Soviet-Russia and World War III to begin the destruction of their religious institutions—but by the late 1980’s, saw socialists the world over cringing in fear as the Soviet Union began its implosion to collapse. Coastal flooding and crop failures would create an exodus of ″eco-refugees,′ ′ threatening political chaos, said Noel Brown, director of the New York office of the U.N. Environment Program, or UNEP. As the warming melts polar icecaps, ocean levels will rise by up to three feet, enough to cover the Maldives and other flat island nations. Coastal regions will be inundated; one-sixth of Bangladesh could be flooded, displacing a fourth of its 90 million people. A fifth of Egypt’s arable land in the Nile Delta would be flooded, cutting off its food supply, according to a joint UNEP and U.S. Environmental Protection Agency study. 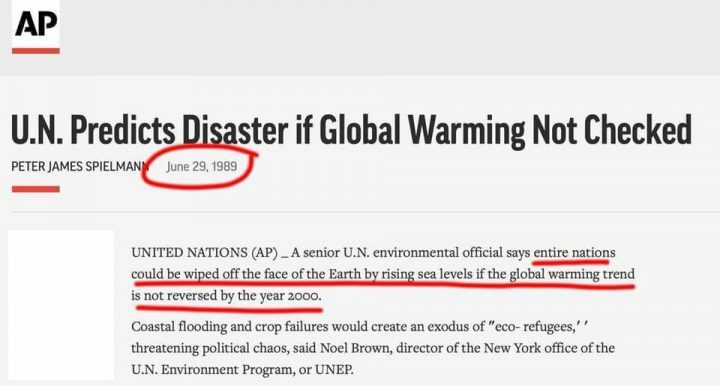 With 30-years of history showing how provable the socialists “Global Warming” lies were, as not a single one of their dire predictions even came close to being true, this report continues, President Trump began to expose these socialists for the power mad maniacs they truly are—that they retaliated against him for by launching a fairy tale Russian collusion plot to throw him from power with, but that today sees one of its main instigators of, former FBI Director James Comey, declaring that he doesn’t even know if Trump colluded with Russia, and his beyond comically claiming he doesn’t even care. In further attacking Trump, this report notes, his socialist Democrat Party enemies, also, began hysterically proclaiming that he was singlehandedly threatening all the norms that have made the US Constitution work for nearly 200-years—a beyond laughable claim as it’s these Democrats who, in fact, have begun a sustained attack against the US Constitution’s over two-centuries old provisions regarding the Electoral College and Supreme Court. Going from outright lunacy to downright hallucinating idiocy, though, this report further notes, these socialists then decided they’d slam Trump over the head with yet another “Global Warming” threat—and as exactly like they did 30-years ago in 1989, saw the socialist-led United Nations gravely warning that our world now only has 12-years left before an unstoppable catastrophe is upon us all. 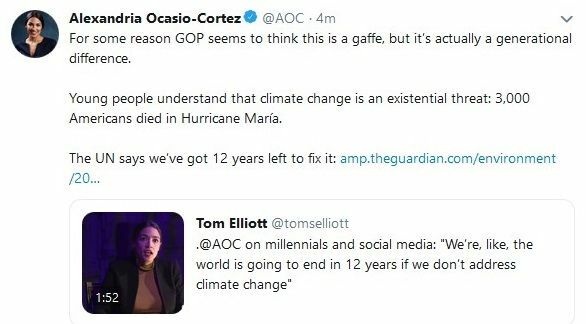 Quickly seizing upon this latest dire UN hoax warming, this report further details, was socialist Democrat Party US Congresswomen Alexandria Ocasio-Cortez—who unveiled before the American people her socialist manifesto named the “Green New Deal”—that would place every single US citizen, every building and every business under complete government control forever—a despotic and tyrannical style of government Ocasio-Cortez champions as evidenced by her lavish praise of socialist New Zealand Prime Minister Jacinda Ardern—who after seizing all of the guns from her citizens, saw Ocasio-Cortez proclaiming “this is what leadership looks like”—a proclamation quickly joined by socialist leader Hillary Clinton, likewise, praising Ardern for seizing her citizens’ guns—and, in turn, was praised by socialist leader Bernie Sanders, too. With socialist leaders Ocasio-Cortez, Clinton and Sanders falling all over themselves in praising Prime Minister Ardern’s seizing all of her citizens’ guns, this report says, it’s important to note that the guns being seized are semi-automatic rifles that are comically being called “weapons of war”—a claim that stands in opposition to the fact that any military commander, in any army, sending his troops into battle with these weapons would immediately be tried for treason as all of his soliders would meet quick and certain deaths from real “weapons of war”—they, also, are tearing down all US Constitutional norms as it pertains to their nation’s citizens rights to have these guns as enshrined in its Second Amendment—which President Trump, of course, is defending as he’s sworn an oath to do. Watching as President Trump not only took on these socialist maniacs, but destroyed them, too, this report explains, were the once free peoples of Britain—and who, on 23 June 2016, voted to separate themselves from the socialist tyranny imposed on them by the European Union—but whose elite socialist government leaders, most particularly Prime Minister Theresa May, have created a deliberate travesty of this UK-EU divorce process—and whose purpose of doing so is their hidden master plan to revoke Article 50 (the part of the British withdrawal law that governs the Brexit process) in what history will record as the greatest betrayal of the British people. 4.) US citizens committing sedition and/or treason fall under the jurisdiction of US Military Law—the ultimate penalty of which is death. March 22, 2019 © EU and US all rights reserved. Permission to use this report in its entirety is granted under the condition it is linked back to its original source at WhatDoesItMean.Com. Freebase content licensed under CC-BY and GFDL.